I hate Wassail ...and not just because it is semi-difficult to pronounce. If you've never had this Holiday drink, let me give you the details. Take a liquid similar to hot apple cider (Vinegar will work), add a bunch of potpourri, and 3 tablespoons of Nutmeg. Heat in pot until the recipients are unsure if their throat is burning from the heat, or from the flavor. 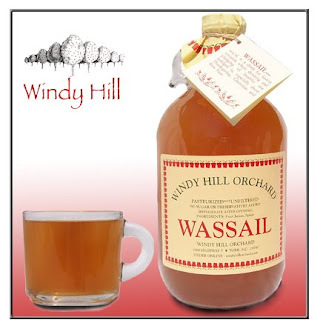 You think it's coincidence that a bottle of Wassail looks similar to moonshine??!! I'm not sure what Patron Saint declared Nutmeg the official "spice" of Christmas, but I'll be sure to kick them in the crotch assuming I don't go to Hell. I swear every little Christmas "goody" we receive from neighbors have the faint smell of nutmeg. It's a holiday requirement. To complete this Wassail holiday tradition, you should invite hordes of people over to your house to sing Christmas Carols. When this obviously uncomfortable activity is over, start shoving goodies and treats into your mouths. Chase promptly with a hot, sizzling cup of Wassail. Repeat yearly. Take a look around the room at people trying to stomach this witches brew. You'll see some people that appear to be drinking, but they're actually getting a contact high from the liquid touching their lips. Trying to drink Wassail is like swallowing mouthwash--liquid fire. I remember when I was a youth in a church group, we would go "Wassailing" to elderly people during the holidays. Wassailing is an old English term for Caroling. Wassailing has nothing to do with Wassail. (the drink) Unfortunately, my far-too-enthusiastic youth leaders always thought the two went together. So, we'd go door-to-door singing "here we come a-wassailing," followed by a get-together at the church drinking what was termed "Wassail." I wonder if the term Wassail was historically coupled with Apothecary? If you're the type that runs to suckle on some lemon-herb tea every time you think you have the sniffles, you may like this dragon-piss. If at least 40% of your taste buds are functioning properly, then odds are you will want to spit after you rinse. I can see it now--Wassail flavored Listerine. You heard it here first. I have prior art. 1 stinky nutmeg star out of 5...and the 1 star is because it reminds me of Christmas. Hope you and your family, Matt, and the rest of the team there and their families, have a Merry Christmas and a Happy New Year. See you after the holidays.